The functional USS Oak Ridge, a forward-deployable floating dry dock that participated in World War II, is being auctioned off by the U.S. government. The offering was set to close at 12pm PDT today, but a flurry of late bids has extended the bidding. The odd thing about the sale is that Oak Ridge's utility may be greater now to the U.S. Navy than it had been in decades. So selling it off for pennies on the dollar seems like a questionable move. There are also a number of interesting files attached to the auction post which you can check out here, here, and here. The 536-foot long, 81-foot wide, unpowered vessel can handle vessels the size of nuclear fast attack submarines and smaller. It is a closed bow, open stern design that allows it to be moved across the oceans to different locales. The addition of rudders and onboard generators means the vessel operates similarly to a standard ship during transits, but it has to rely on some form of tow vessel for propulsion. It was built with all the amenities of a normal Navy ship and to support a crew of nearly 200. Oak Ridge was originally commissioned as auxiliary repair dock USS ARD-19 during World War II. It supported the Palau offensive and took damage during an attack on San Pedro Bay, where ARD-19 was servicing the destroyer USS Ross at the time. A Japanese Tojo fighter careened into it and a large fire broke out in the dry dock area after the aircraft ripped through the vessel's outer wall. The fire was in the process of being extinguished when another Japanese fighter made a strafing run on the ship, but before it could do much damage, ARD-19's gunners shot down the assaulting aircraft. Not bad for a lowly dry dock! 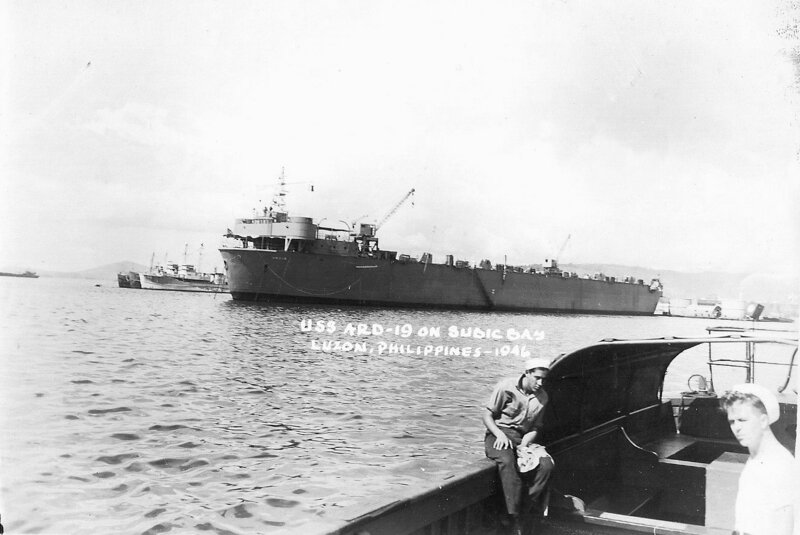 In a relatively short period of time, the ship was back operational again and not long after the incident, ARD-19 was towed to Subic Bay where it spent the rest of the war tending to very needy U.S. Navy ships. The dry dock spent time in the reserve fleet and executed miscellaneous roles after the war. She was then recommissioned as USS Oak Ridge (ARDM-1) in 1963 after extensive modifications and upgrades. Her new role was to support America's burgeoning Polaris ballistic missile submarine force. She was the only ship that could put these submarines into dry dock and transport them over long distances if need be. Oak Ridge with a submarine in its dry dock area. The newly minted Oak Ridge stood up service at Naval Base Rota in Spain in late 1964. Over the decades she continued to support the Navy's submarine force, and later in life, this included exclusively servicing nuclear fast-attack submarines due to the increased size of the Navy's ballistic missile carrying subs. This was her role up until her retirement in 2001, with Oak Ridge's last station being Naval Submarine Base New London in Connecticut. Oak Ridge was transferred to the Coast Guard after being struck from the Navy register and has served as a dry dock facility at the Coast Guard's shipyard in Curtis Bay, Maryland ever since. In fact, Oak Ridge received a basic service life extension in 2013. This included structural and systems rehabilitation, as well as the installation of new communications systems and other technological enhancements. Oak Ridge at the Coast Guard's shipyard in Maryland. Originally the Coast Guard saw the ship as only being usable for five years, but it has remained in an operational state despite being nearly 75 years old and receiving relatively minimal investment. And although 75 years may seem ancient, that is comparatively young compared to a number of the Navy's fixed dry dock installations. USS Oak Ridge pictured with USCGC Eagle in its dry dock in late December 2017. And that's why getting rid of Oak Ridge seems a bit puzzling. The Navy has a major dry dock capacity deficit, and many of the ones it does have are decaying rapidly, an issue that the Navy, now flush with cash, is trying to remedy but it will be a long and arduous process doing so. Considering Oak Ridge can accommodate nuclear fast attack submarines, and anything smaller, not to mention it is portable and can be moved if need be, it seems like a good candidate for reenlistment to meet the Navy's growing needs, especially in terms of submarine maintenance and service. The Navy is experiencing a damning backlog of dry dock time for these essential and hugely expensive national security assets. This has resulted in some subs being sidelined for years just as the Navy says it is sorely lacking in submarine capacity to meet tasking demands. The annual maintenance and depreciation cost for OAKRIDGE is $957,000 per year. At present, the operating and maintenance costs of OAKRIDGE are 11 times greater than the ship lift system (per linear foot of useable dock space). Floating dry-docks are required to be dry-docked themselves once every 10 years, to perform hull inspections and maintenance, consistent with both Navy and Coast Guard requirements. The Yard performed dive inspections on OAKRIDGE instead of dry docking; OAKRIDGE has not been docked since the mid-1990s. At present, there are no active shipyards in a safe transit distance from the Yard that have the capacity to dry dock OAKRIDGE to perform this maintenance, and even if dry-dock facilities were available, the costs would be prohibitive, so this work has been permanently deferred until OAKRIDGE is removed from service. This all sounds logical for the Coast Guard, but maybe not so much for the Pentagon's increasingly needy naval portfolio. Additionally, the dry dock is going to have to be transported by its new owner, so clearly it can be moved. Putting it through a much-needed dry dock period itself and giving it a deep overhaul may be a far quicker way to gain additional Navy dry dock capacity than building an entirely new dry dock facility. USS Baltimore SSN-704 aboard Oak Ridge in 1997. Even porting Oak Ridge over to a contractor to operate it and make it available for the federal government's needs may make more sense than selling it to a customer that potentially has other uses in mind, which could include ripping it apart for scrap. One can hope this won't be the case. In the past, vessels with similarly unique capabilities have been saved from the scrapper's torch, such as the Hughes Mining Barge and Sea Slice, and put back to work after an overhaul. But there is no language in the auction contract that will require this to occur. And even if it is put back into service, it may do so servicing yachts and commercial vessels, not the Navy's inventory. Currently, the bidding is in its final stages and is up to $1,322,099. Hopefully, with the buyer making that level of investment, the historic Oak Ridge will still have a bright future ahead of it. Bidding has ended with the final strike price being $1,396,099. 18 parties put in bids. Not bad for this old ship that is supposedly not worth keeping!